Here at ComicImpact, we were lucky enough to get a sneak peak look at a hot new graphic novel that is set to be released next week on the 13th of Janurary through Oni Press publishings. I’m Rob, and I’m going to run you through what I thought of this brand spanking new book, and tell you why this is something to check out when new releases hit the stores next week. 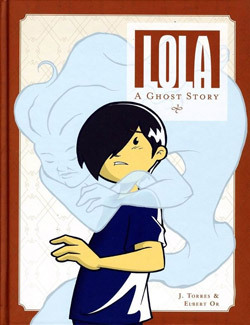 ‘Lola: A Ghost Story’ is a chunky 112 page, hardcover graphic novel, written by J. Torres, and with artwork given to us by Elbert Or. Now, first impressions, given the title of this comic? Well you’d have to be a bit of a numbskull to not work out this is probably going to be a paranormal chiller, and you’d be completely right there, as that’s exactly what Oni Press have pitched this story as. It’s a straight up ghost story, and a good one at that. It really reminded me personally, of the film ‘The Sixth Sense’, in that you have a young boy called Jesse, who is the antagonist, who can see the dead. But it’s not just the dead that he sees, Jesse can also see demons, monsters, goblins, ogres, you name it and he can probably see it. This is where the plot gets interesting, as Jesse doesnt tell anyone that he can see these things, but he knew that the only other person who could see the same things as he can, was his grandmother Lola. Everyone knew of Lola’s abilities and she became somewhat of a local ‘hero’ in her time, using her ‘powers’ for good. Now, Jesse (aged about 15/16 I’d say) and his family from Canada, take a trip back to the small town where his Grandmother lived to attend her funeral, where Jesse has to deal with the long told stories of the townsfolk, about the local demons and monsters that exist nearby in the village. Not everyone may believe these stories, but Jesse might do. To make matters worse, Jesse has to live in the house of his deceased grandmother, which is the same place where one of his childhood friends passed away, whom he knew from when they used to play there as kids. An interesting, and already eerie pitch huh? I should bloody well say so. After a first read through, you think to yourself “Hey, I really enjoyed myself, let’s go round again”, it’s the whole ‘my first trip on a rollercoaster’ syndrome (given that you actually enjoy rollercoasters, otherwise such a reference is wasted on you, ha). The second read through is highly beneficial as well, as you pick up on stuff that you didn’t see when reading it the first time, you see things in the artwork that are suggestive to the plot in a new light and so forth. I want to start out here by saying that the paranormal aspect of the book is not at all overplayed, infact it’s tactically ‘underplayed’. In that the depictions of actual gauls, demons and scenes of horror are rare, and that it relies on the intrigue supplied in the clever writing, to keep you hooked in anticipation for the next appearance of a good spook. If anything, I would say this is more of a psychological thriller, than a story about ghosts, as it often shows how Jesse deals with these visits and encounters with ghosts. It’s obviously a paranormal book as well, no question about it.. but the individual interpretation for either a psychological, or paranormal book, is still there. It starts out at a fairly steady pace, giving decent backstory on the relationship that Jesse has with this place his Grandmother used to live, and his relationship with his Grandmother. The same steady pace is maintained throughout the entire graphic novel, and works really well if you read it in one go without putting it down. The plot does not weaken at any given point, as there are plently of gripping moments, and areas of story development to keep us going from start to finish. The artwork was a lot of fun too. With Elbert Or giving us art in simple style, and with simple colours, your first impressions are ‘how can this man draw demons and still make them look scary?’. Well I have to admit I doubted his ability to depict scary looking dead people and so on, but I take back what I initially thought about Elbert’s ability.. he can draw really frightening demons. What makes it so scary and surprising, is that the whole book is usually drawn in a lovely, romantic style where everything looks joyous and at ease.. but then when you come across a monster it really catches you off guard. The drawn style of Elbert Or slightly reminded me of Scotty Young in a way, which was a nice touch, ha. Also, everything is black and white, or coloured in sepia tone, which really added to the atmosphere of the story. In toto, J. Torres and Elbert Or have created a chilling and intellectual story of ghosts, demons and the unexplainable. It’s definatly worth checking out if you get the chance. We were very grateful here at Comic Impact, to be given the chance to read this awesome graphic novel. We hope that you’ll check this out. If you like paranormal ghost stories that give you chills, or are just looking for something with a little twist that is still a heck of a lot of fun, then give ‘Lola: A Ghost Story’ a try, it’s the sort of book that never gets old after however many reads.